In case you missed it, on Sunday (December 7, 2008), the final chapter to what was quite possibly the most (in)famous case of an attempted murder using insulin ended. The case, of course, was the attempted murder of Martha "Sunny" von Bulow, which was televised by the international media when it went to trial back in the 1980's. Her husband, Claus von Bulow, went to trial for her attmpted murder using insulin not once, but twice. He was first convicted, which was later overturned, and he was again tried for attempting to murder her using insulin a few years later. On Sunday, Martha "Sunny" von Bulow died in a nursing home on the Upper East Side of New York City. Her death was confirmed by Lucas Dedrick, the director of the Mary Manning Walsh Home where she resided, and Maureen Connelly, a spokeswoman for Mrs. von Bulow's family. Her family stated her age as 76; although records introduced at her husband's trials and a book written about the case indicate that she was 77, so her precise age is a bit unclear. Sunny was born as Martha Sharp Crawford in Pittsburgh. Apparently, "Sunny" got that nickname because of her disposition. She was the only child of Pittsburgh utilities magnate George W. Crawford, who founded Columbia Gas and Electric and Lone Star Gas Company, and his wife, Annie Laurie. Mr. Crawford died when his daughter was just 4. Sunny was left a substantial trust fund worth tens of millions of dollars. Sunny's mother later remarried Russell Aitken and they lived in Newport, Rhode Island, not far from where Sunny would later buy her own summer mansion. When Sunny's mother, Annie-Laurie Aitken, died in 1984, she left Sunny an estate estimated to be worth more than $100 million, which Sunny's three children have now inherited. Sunny von Bulow was an heiress, much like Paris Hilton (except that people actually liked Sunny, and this particular heiress avoided the spotlight, unlike Paris Hilton (that world-class bimbo topped Forbes.com's new list of 'Most Overexposed Celebrity'). Sunny grew up in New York City and graduated from St. Timothy's School, an exclusive girls' school outside Baltimore. Sunny von Bulow was beautiful and glamourous (IMHO, quite unlike Paris Hilton, who I think is a looks like trash). Anyway, Sunny von Bulow's second husband, Claus (who was born Claus Cecil Borberg in Denmark but later adopted the name Von Bulow from one of his mother's German ancestors because it supposedly sounded more like royalty than the Borberg surname did) tried to kill his wealthy socialite wife using insulin. Sunny had two children from a prior marriage to Austrian Prince Alfred von Auersperg, who was reported to be a penniless 20-year-old Austrian who was teaching tennis at a resort in Europe. They lived in Europe until their divorce in 1965. In 1966, Sunny met Claus von Bulow and married him. She also had another child with von Bulow. The von Bulow case revolved around an attempted murder by her husband Claus -- the overdose insulin was supposedly intended to induce a coma caused by hypoglycemia so he could inherit her fortune and marry a soap opera actress with whom he was reportedly having an affair. Of couse, Sunny did not have any form of diabetes which meant that a very large dosage was required to overcome the normal counterrugulatory response (people with type 1 diabetes don't have this luxury), but because insulin could easily be purchased from any pharmacy over-the-counter, it was very easy to obtain. I question how this woman could be completely unaware that she had been injected with a hypodermic syringe containing a large dosage of insulin and be unaware of it, and apparently, so did the young attorney, Alan M. Dershowitz who argued for Claus von Bulow that Sunny was an alcoholic and drug abuser who was subject to attacks of (presumably reactive) hypoglycemia. High-profile friends, including writer Truman Capote and Johnny Carson's ex-wife, Joanne Carson, testified that Sunny had used drugs extensively -- a charge her older children denied. Just what made the von Bulow case so compelling? The case involved everything needed for tabloid fodder: high society, massive wealth, a fictitious name (von Bulow was a Danish financier, but as noted, von Bulow wasn't his real last name), a second marriage gone bad, a cheating spouse, 2 children from a former marriage to a European Prince, no Will & Testament or living will, two attempted murders by her husband, an aggressive young attorney looking to make a name for himself, and more. Sunny lapesed into her first coma on December 27, 1979, but was soon revived. However, a year later, on December 21, 1980, she was again found unconscious on her bathroom floor and never recovered. Her children financed a $400,000 private investigation that led to Claus von Bulow's indictment in 1981. They alleged that Claus von Bulow was having an affair and stood to inherit $14 million if his wife were to die. The Von Auersperg children then filed a $56-million civil suit against Claus von Bulow in 1985. Of course, Sunny did not die, but she did remain in a coma for the past 28 years. Her children decided that since she had no living will and had the financial means, that she would be kept alive in a private, guarded room in the Harkness Pavilion and later the McKeen Pavilion of Columbia-Presbyterian Medical Center. She died at the Mary Manning Walsh Nursing Home, her family said. At the first trial, which was televised internationally in 1982, her husband Claus von Bulow was convicted of trying to kill her by injecting her with insulin at their estate in Newport, Rhode Island. However, that verdict was thrown out on appeal. He was subsequently acquitted at a second trial for the same crime in 1985. Ultimately, the high-drama civil suit was settled two years later with the agreement that Claus von Bulow (now 82 and living in London) would file for a legal divorce and never speak in public about the case again. He renounced any claim to her fortune. At the time, the von Bulow murder case split Newport society, produced lurid headlines and was later made into a film called "Reversal of Fortune," starring Glenn Close and Jeremy Irons. Why would someone want to use insulin to kill someone? Well, at the time, murder by means of insulin was mistakenly viewed as undetectable, thus it was used by many mystery writers in murder novels. Of course, that may have been true in the old days, well before the 1960's, but by 1982, it was possible to measure insulin in blood. Remember, insulin injected into the body is never dosed in a physiological manner, therefore the "precise" dosage amount can also never be administered by a human being -- even if that person is a doctor. As a result, some insulin remains in the blood (or urine), which can easily be detected by fairly standardized laboratory tests (even from a corpse). The von Bulow case was certainly not the first attempted murder using insulin as a murder weapon. The first recorded case of a so-called attempted suicide using insulin was recorded in 1927 (just 6 years after insulin was discovered in 1921). However, the BBC reports that insulin's first use as a murder weapon was recorded in 1957, and since then there have been about 50 or so cases globally of insulin being used either to kill, or to try to kill. Here's the scary part: most of the attempts to use insulin as a murder weapn have been primary by medical staff who find the hormone very easy to obtain! 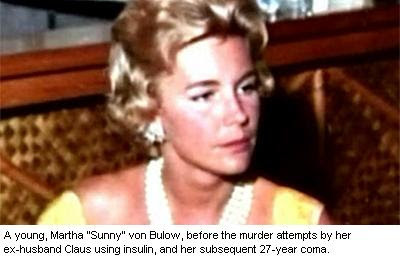 In the von Bulow case, Claus von Bulow was accused of injecting his wife, "Sunny" von Bulow with insulin first in December of 1979, causing her to lapse into a coma from which she later revived. But prosecutors said that he tried to murder his wife again a year later, on December 21, 1980. At that time, the 49-year-old heiress fell into an irreversible coma at their estate in Newport, Rhode Island. Prosecutors for the case claimed that von Bulow's coma was induced by insulin. Ultimately, von Bulow was acquitted at the second trial in 1985. Interestingly, the von Bulow case was among several chronicled in an interesting book entitled "Insulin As A Murder Weapon" published by Royal Society of Medicine Press. British Professor Vincent Marks co-wrote the book with journalist Caroline Richmond (see here for a book review). "The Von Bulow case highlights how a prosecution case that is totally without merit and that should never have been initiated in the first place can lead to an innocent person being convicted of a non-existent crime, merely for lack of expert knowledge and the difficulty of conveying complex scientific facts to a judge and jury," Vincent Marks told the BBC. von Bulow's wife fell into a coma, which the prosecution claimed had been triggered by a rogue insulin injection. But Professor Marks argued for von Bulow that her condition was more likely to be related to heavy alcohol consumption. IMHO, she HAD to be passed out drunk not to have noticed he was injecting her with massive amounts of insulin! Although insulin can be used to kill, Professor Marks said it was actually a very poor murder weapon. Detecting insulin's use was difficult, but not as many assumed, impossible. "It is not a very good weapon, it is easy to kill babies and old people with insulin, but not adults." With the von Bulow case closed completely, my only question is why anyone tried to put Sunny into a coma, if anyone should have such a thing happen to them, surely it's Paris Hilton, whose main contribution to the world is ???? (1) It was my understanding that insulin is nearly impossible to detect post mortem, as some biological processes continue after death. I thought the only way a coroner could actually determine bG level, post mortem, was to timely check the vitreous of the eye or the blood remaining (unpumped) in the heart chamber. I haven’t read as much as you . . . could you direct me to citations for post mortem analysis of bG level? (2) Was the fact addressed—during the investigation and trial—that many socialites were using insulin for weight control. They wanted to have their cake, eat it . . . and not gain weight . . . you know, ‘never too rich or too thin.”. A little shot of insulin was just what the socialite ordered to take care of troublesome excess calories. Additionally, it is known that alcohol consumption (in diabetics) lowers bG. Also, if Sunny was a very heavy drinker, her liver may well have been significantly impaired, preventing it from adequately performing its (insulin) counterregulatory role.Is it possible that insulin-based weight control and alcoholism might have been used by Sunny, herself, with unexpected/unintended consequences? (3) What do we call it nowadays when a diabetic cannot effectively use synthetic insulins (or analogs)—and those are the ONLY medications available for doctors and patients to manage this disease called diabetes? Do we call it murder by pharmaceutical? Do we call it murder by M.D.? Sadly, no. We call it “patient noncompliance.” We blame the disease . . . we blame the victim, but we NEVER blame the drug, those who manufacture it, nor those who prescribe it. I believe ‘murder by insulin’ is an unacknowledged scourge on the diabetic population, quite possibly occurring multiple times a day throughout our society; a scourge that is unacknowledged, ignored and ONLY penalizes the patient (and those who care about him/her). A male body is found and has already decomposed to the point of turning black and also to the point of being mistaken for a black woman. Insulin is suspected as being used to kill him with can it be traced to find out? The man would have had to have been dead for at least 14 days. Can you put insulin into ice trays and a person be unknownly overdosing themselves with insulin everyime they comsume something with the ice cubes? To Anonymous: The answer that it is highly unlikely, although you really need to address your question to a pathologist. However, you should know that insulin is a protein which must be injected into the body order for it to enter the bloodstream; insulin placed into ice cubes would not enter the bloodstream and therefore one cannot overdose themselves by taking insulin in that manner, otherwise patients with diabetes would not be forced to inject themselves.